Dubai, UAE, November 03, 2018: It’s the season to be gorgeous! The festive season is here, and there’s magic in the air. It's the time to look your best for those glamorous late-night events and fun-filled festive parties with family and friends. And while a little sparkle on your outfit would be a perfect way to go about it, you’ll need that glow on your face to go with it. In this busy time, the chances are that you’re not going to find the time for your usual skincare routines. So, the next best thing is to use a sheet mask as a highly concentrated quality sheet mask works like a charm and can quickly help prep your skin for a long-lasting glow every single time. Skin Republic’s face masks are ideal for the holiday season for an instant fix and even for a festive feel & look thanks to its range of luxury metallic masks. Gold Peel-Off Face Mask (AED 33) - This luxurious gold peel-off mask combines the anti-aging benefits of Gold with the deep cleansing properties of a peel-off mask. Rich in age-defying minerals and fruit extracts this mask intensely nourishes and smoothes away fine lines and wrinkles for a luminous complexion. Key ingredients are Gold, Green tea, and an eight-fruit acid formula that includes blackberries, aronia berries, pomegranate and soy bean. Platinum Peel-Off Face Mask (AED 33) – This silver peel-off face mask combines the anti-aging benefits of Platinum with the deep cleansing properties of a peel-off face mask. Platinum has an exceptionally high skin absorption rate, the particles chemically attach to active anti-aging ingredients helping them to penetrate deeper into the skin yielding better youth-renewing results. Colloidal Platinum is believed to be one of highest antioxidant and antiaging ingredients available. Combining this with the exfoliating properties of a six-fruit acid formula, skin is left feeling silky smooth and luminous. A one-way surge of youth activating concentrate immerses your skin with the hero of the skincare hour – hyaluronic acid, in a high performance, foil backed sheet mask. This age-defying mask locks in moisture for nourished, younger and more luminous looking skin. 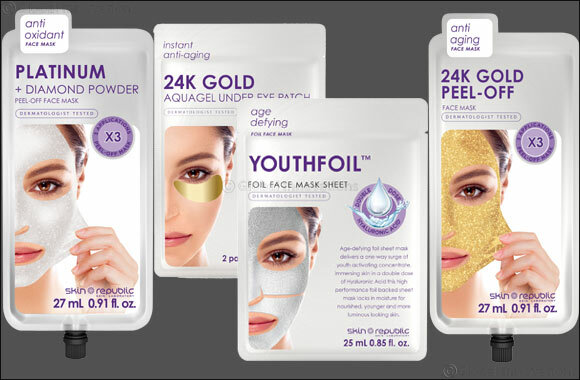 Youthfoil is the mask of choice for anyone looking to revitalise and regenerate ageing skin.